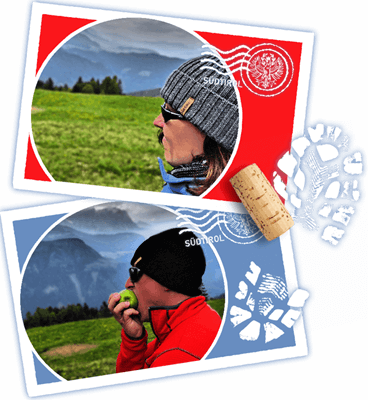 South Tyrol is a land of endearing traditions. 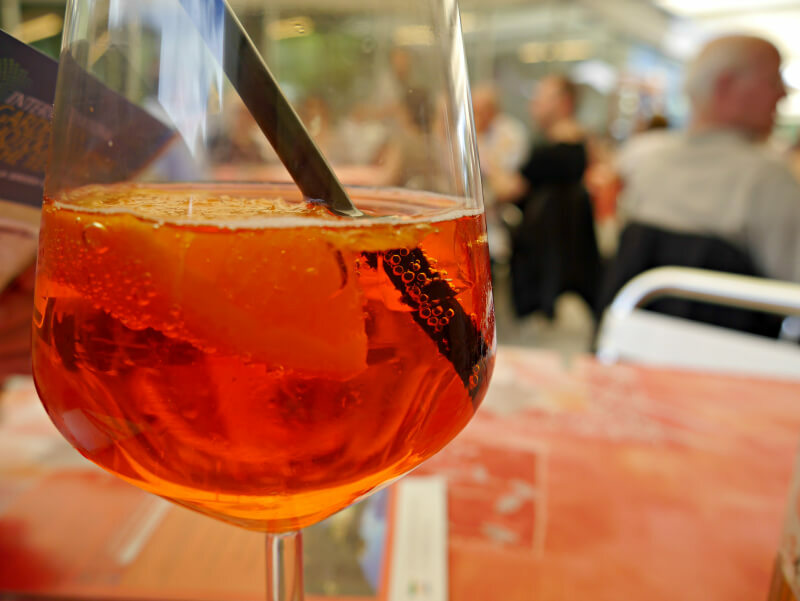 Celebrating age-old customs is embraced and nourished. 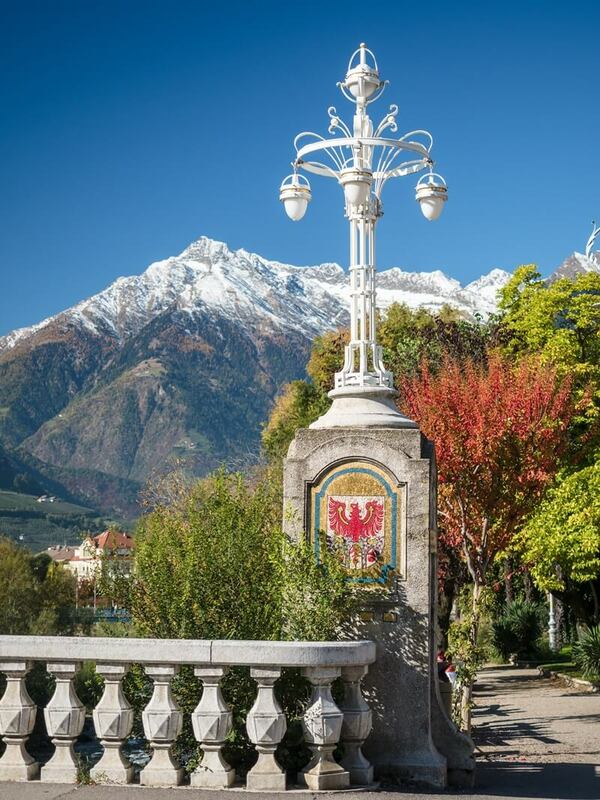 South Tyroleans maintain heartfelt respect for solemn acts of faith — cultivating a historic cultural garden with wayside shrines set among the most beautiful mountains in the world. 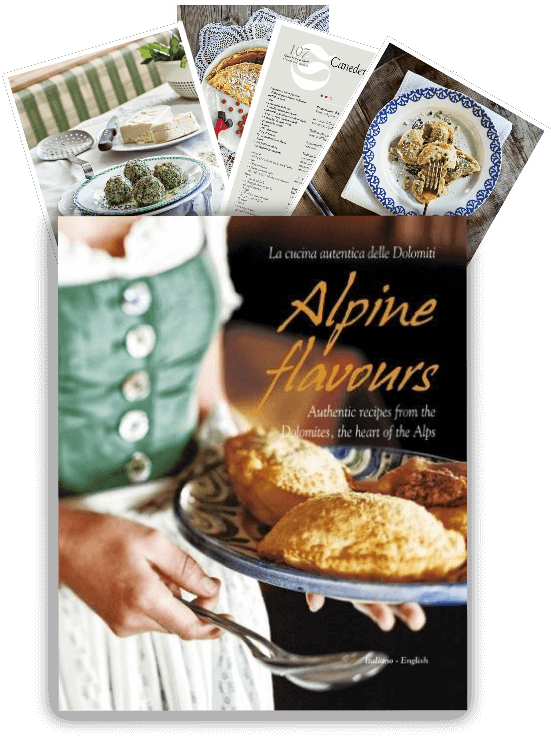 The preservation of its Alpine roots is one of South Tyrol’s more charming aspects. 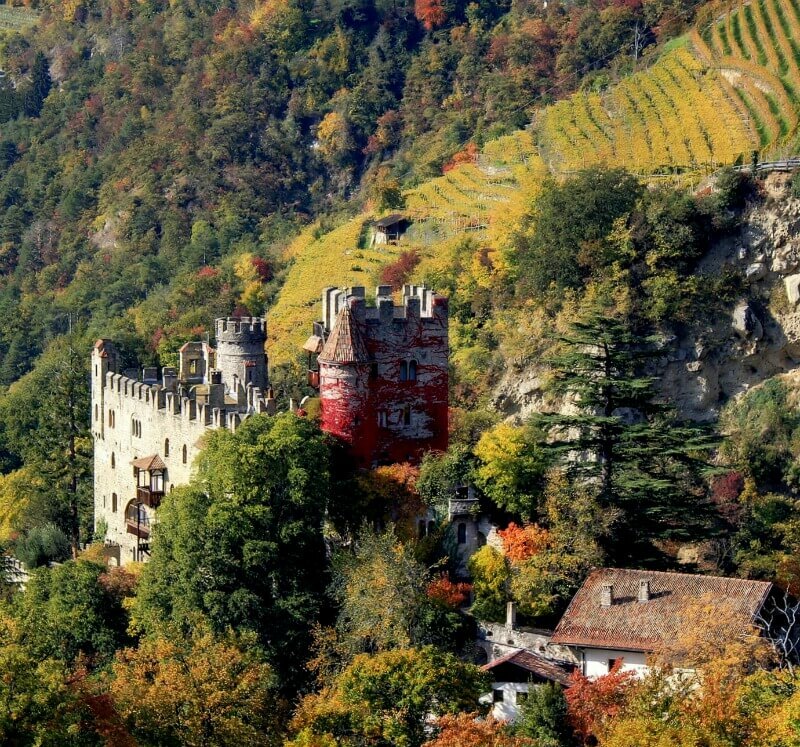 Travelers to this scenic gem get to reap the benefits. 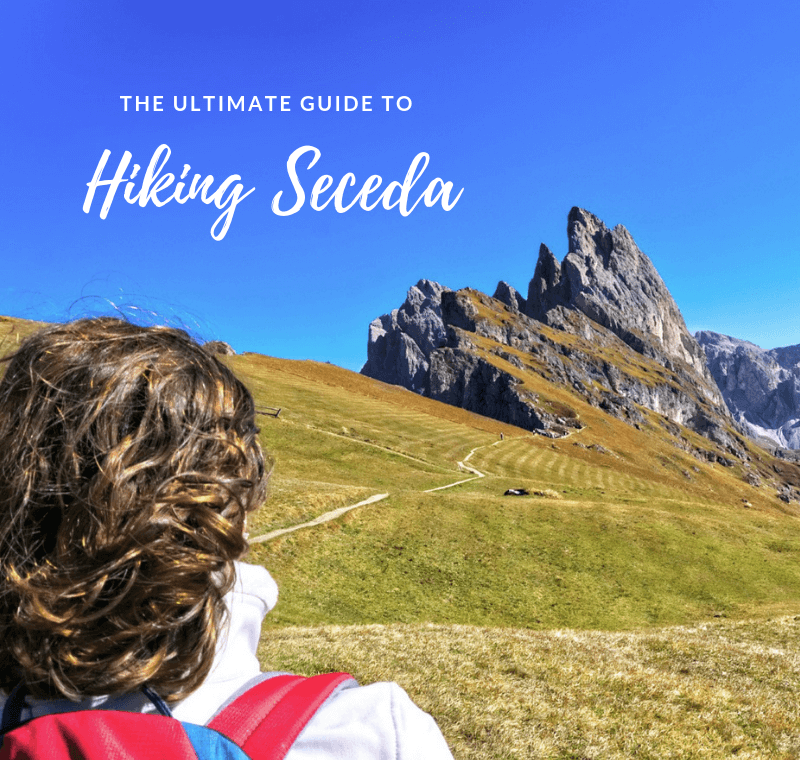 You’ll take in sacred sights that can deeply move you as much as its riveting mountains, lakes, castles and villages. 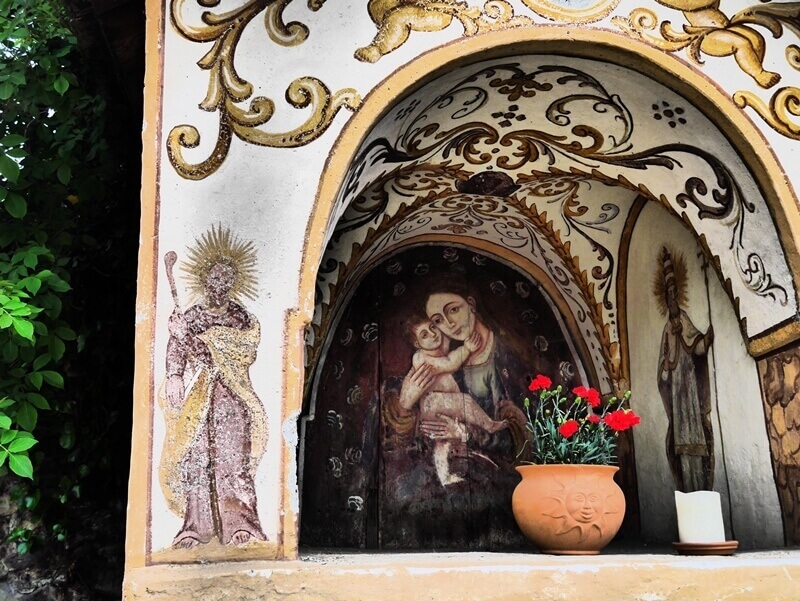 To this day, South Tyroleans creatively express their spirituality through a custom born in Christianity’s earliest years. Ancient Rome’s persecution of the first Christians made the open construction of churches virtually impossible. In their place, the faithful erected small monuments with cryptic Christian symbols to conceal worship from Rome’s soldiers. 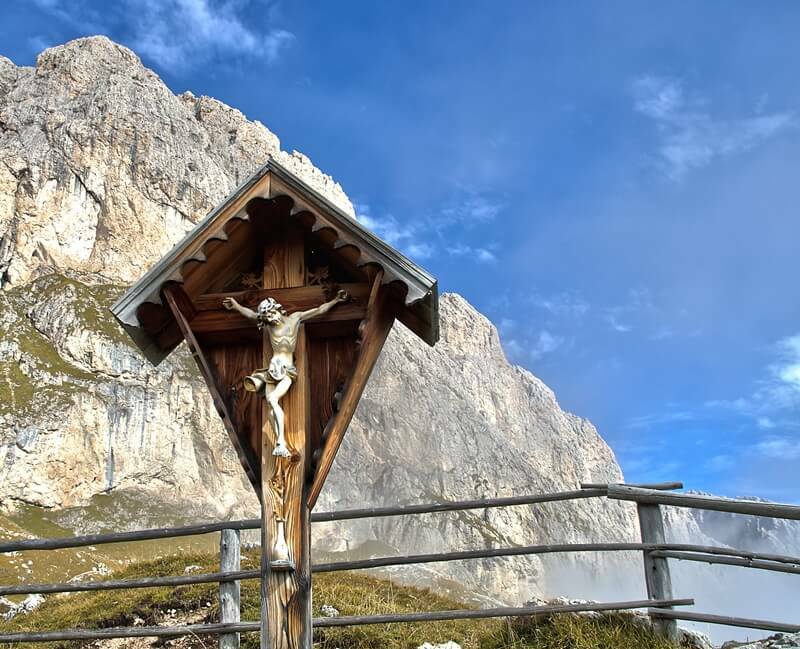 These hidden “signposts” became the earliest Christian shrines. 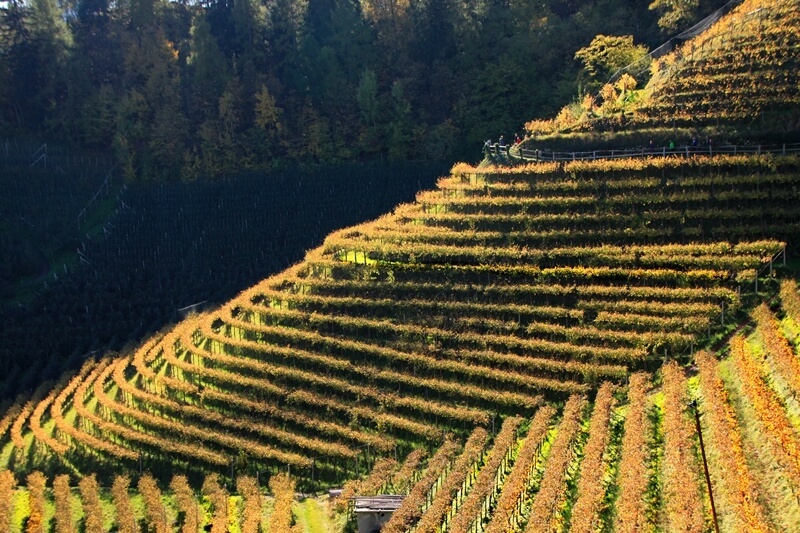 Wayside shrines like this one beautify vineyards throughout South Tyrol. When Constantine the Great, the first Christian Roman emperor, decriminalized Christianity in 313 A.D. by issuing the Edict of Milan, mass persecution of Christians ended. Churches sprung up across Catholic Europe and the tradition of hidden shrines evolved into open illuminations of faith. 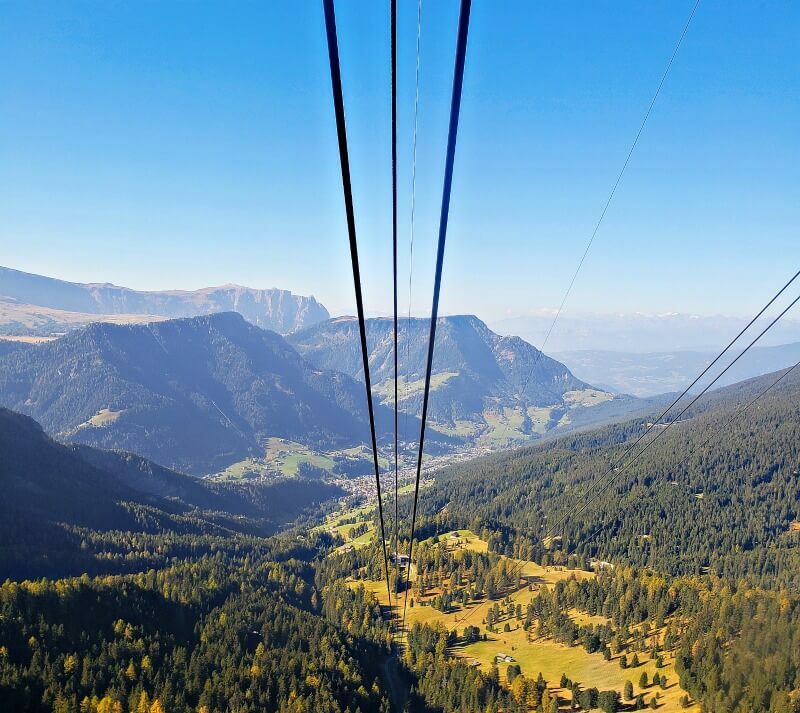 With South Tyrol’s position in the Alps, the land became a bridge so to speak for Christians traveling between northern and southern Europe. Pilgrims would frequently cross over the mountainous landscape where they could encounter danger at any turn. 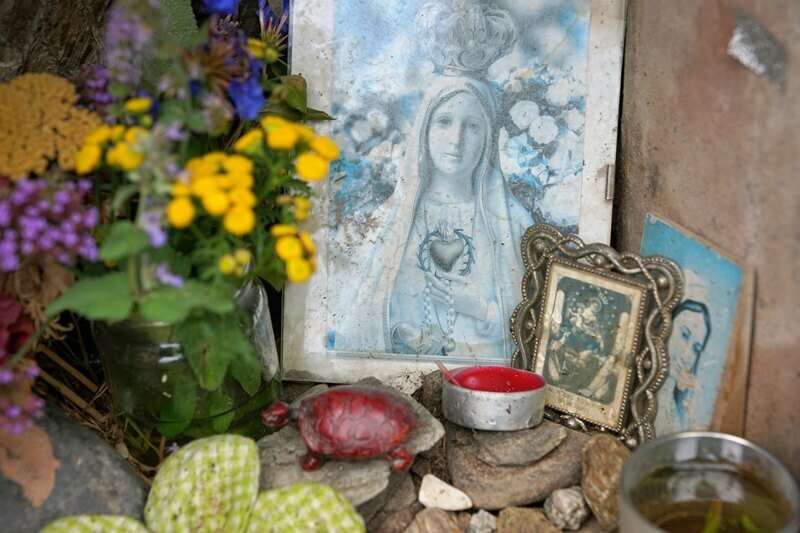 Wayside shrines were welcome sights to those who made the road their home. 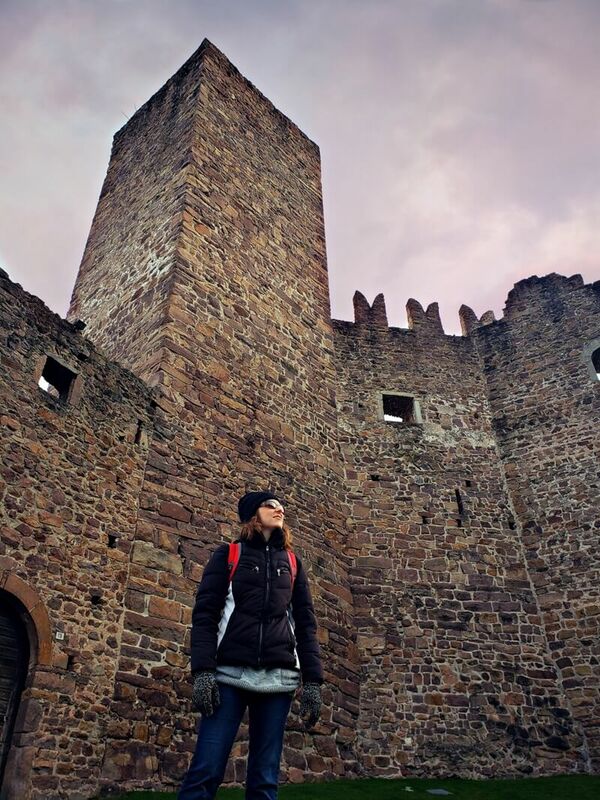 Not only did they serve a spiritual purpose, but also as markers to religious sites such as the Abbey of Novacella (Neustift Monastery). 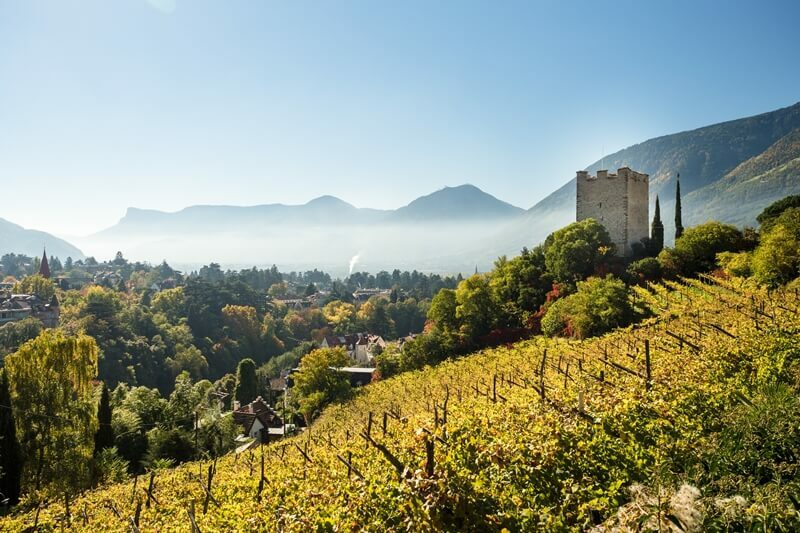 This ancient monastery is nestled near Brixen, South Tyrol’s oldest town, and is one of the oldest wineries in the world. A crossing of the weary breast, a prayer, — at least a sigh. 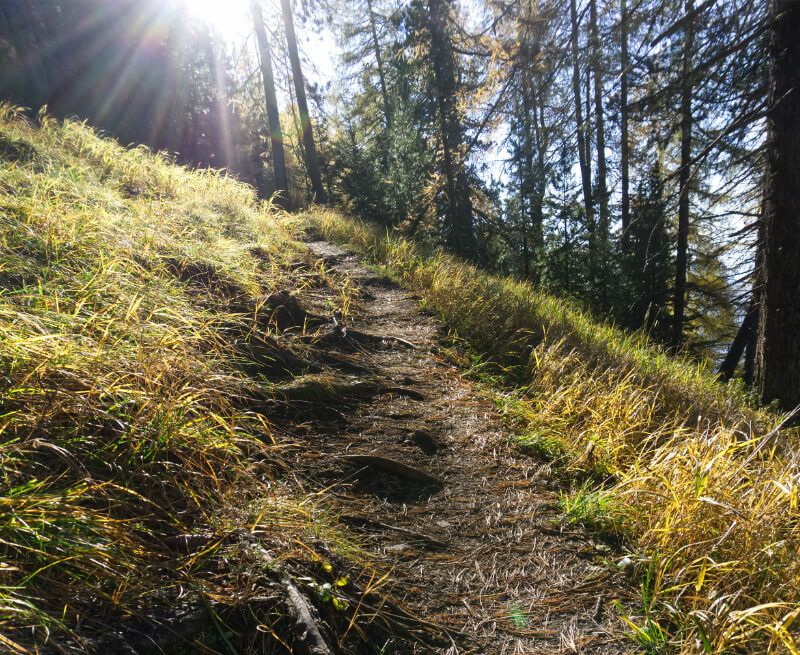 Whether we’re hiking a high mountain trail or meandering along a path in a valley, we always find them a delightful surprise. 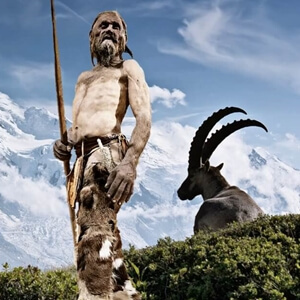 They seem to welcome you out of nowhere — poetically watching over the trail. Inviting a moment of prayer or reflection. 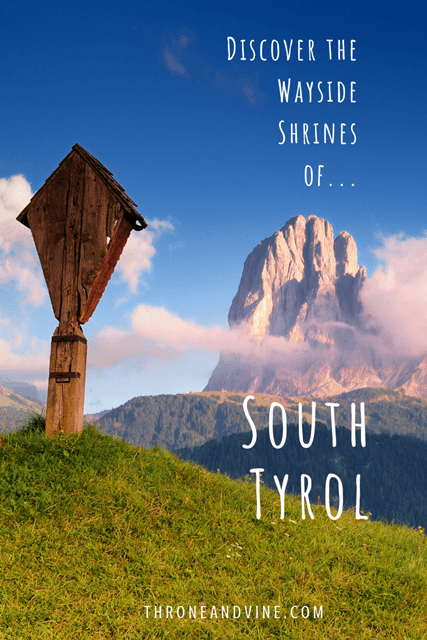 Set along paths, roads and nestled in quaint village nooks, South Tyrol’s wayside shrines come in countless shapes and sizes. No matter how big or small, simple or elaborate, local residents take great care to beautifully harmonize them with the natural surroundings. Each is tenderly crafted from wood or stone. 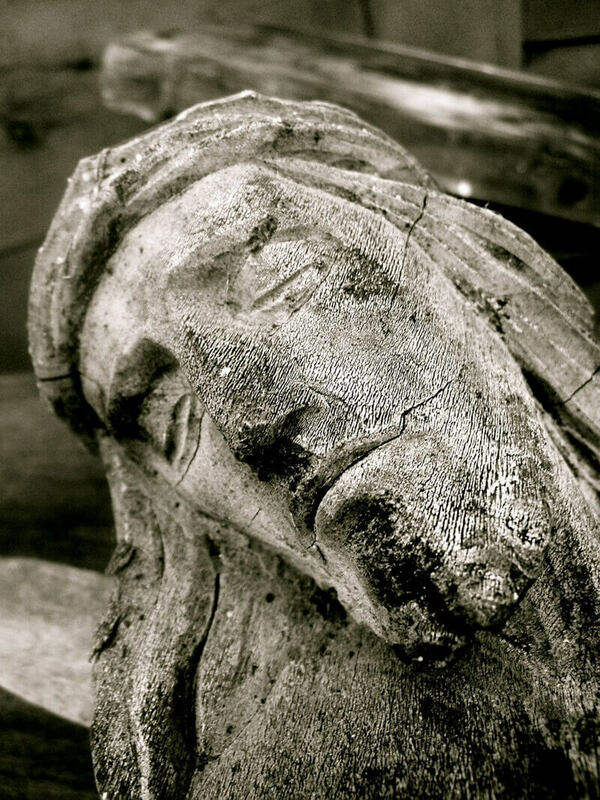 And within many, you’ll find a crucifix or an image of the Madonna hauntingly expressed in various artistic forms. Some also bear rosaries, photographs and other thoughtfully-carved prayers and blessings. The faithful will even keep candles burning, softly lighting all that the shrine holds. Quite often native flowers spring from the foot of shrines intimately binding them with heaven and earth. 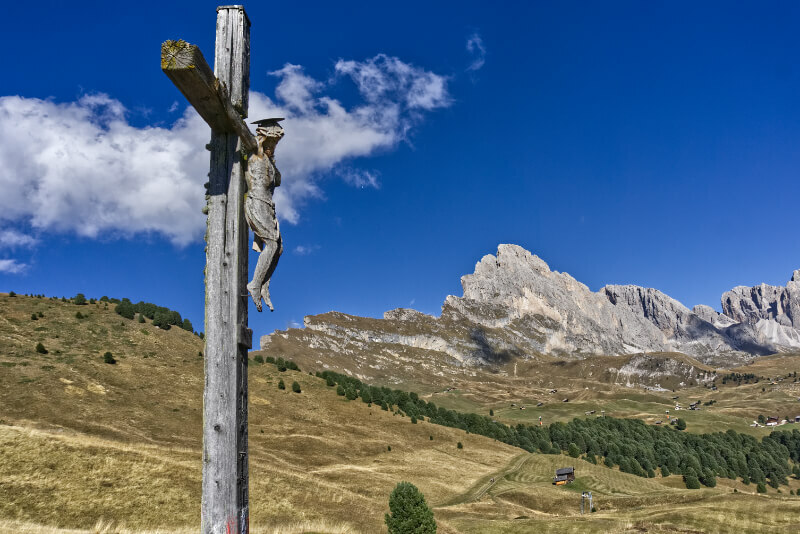 Whether your South Tyrolean adventures carry you to the lofty heights of the Alps or through the bountiful orchards flourishing within valleys, you’ll come across shrines and crucifixes. 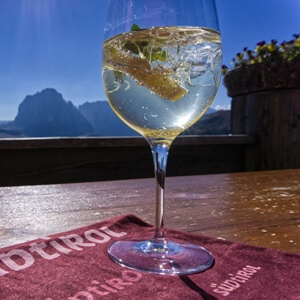 Some of our favorites are along South Tyrol’s Waalwegs, ancient water channels that weave throughout the mountains and vineyards bestowing pure Alpine water from snow-capped peaks. 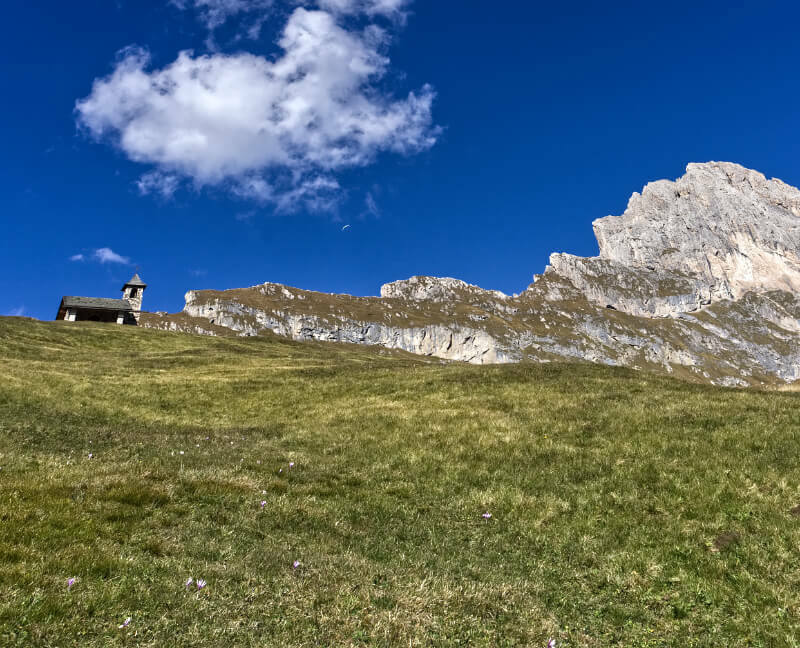 But where wayside shrines captivate us the most is in the Dolomites. 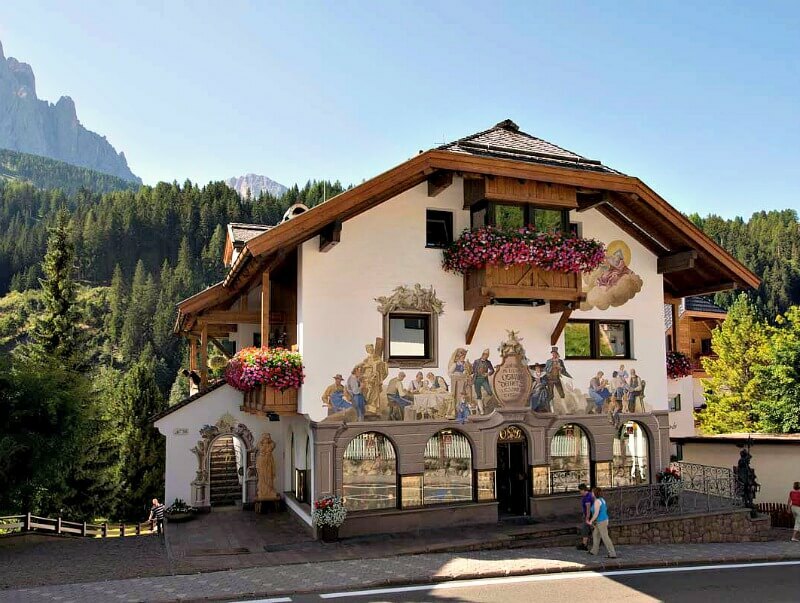 The sight of a wayside shrine against a backdrop of towering stone spires breaking into the Alpine sky is breathtaking. 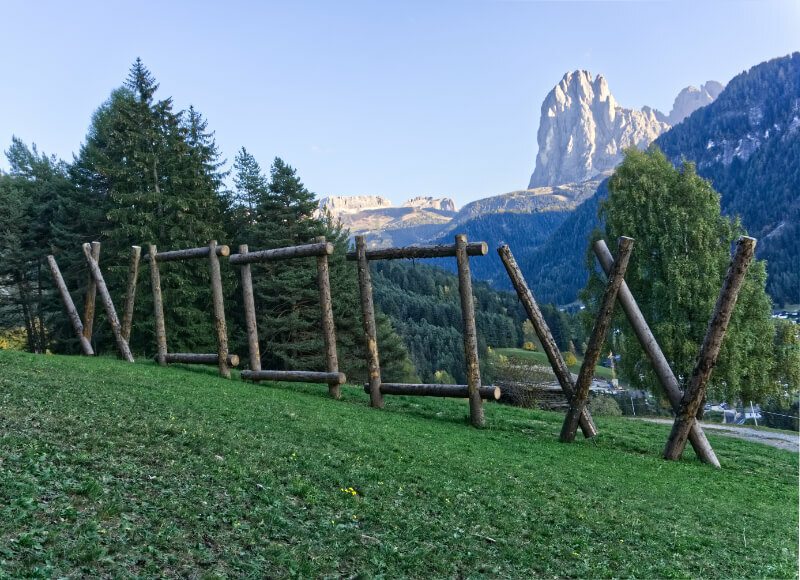 Whether trekking to Seceda mountain or meandering across the prairies of Alpe di Siusi, several notable wayside shrines decorate the paths. 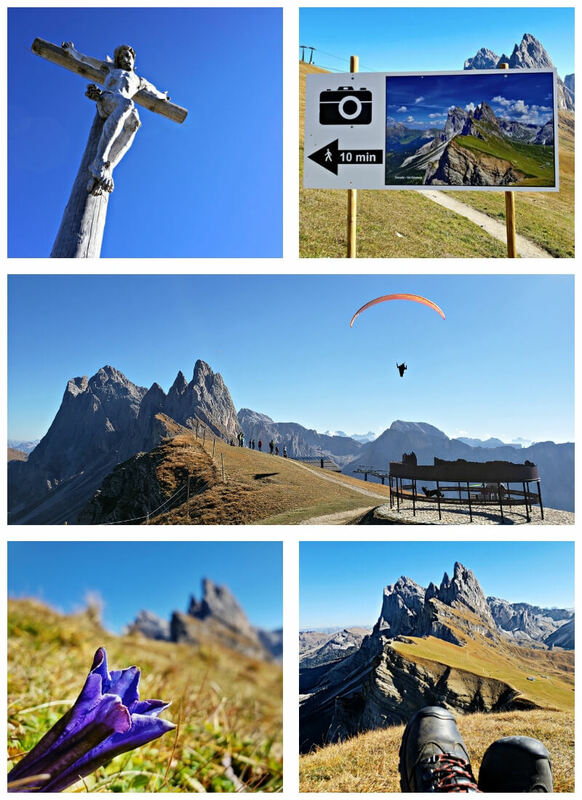 The mountainous jewel of Seceda showcases numerous religious works of art throughout its vast wilderness. 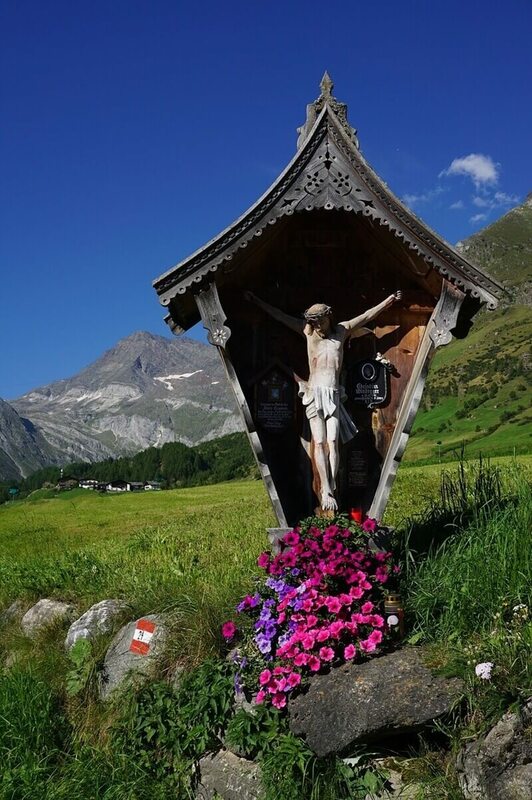 Even if your feet never leave the cobblestone streets of the many villages and hamlets sprinkled throughout the region, wayside shrines can often be found next to age-old churches and quaint gardens of local residents. 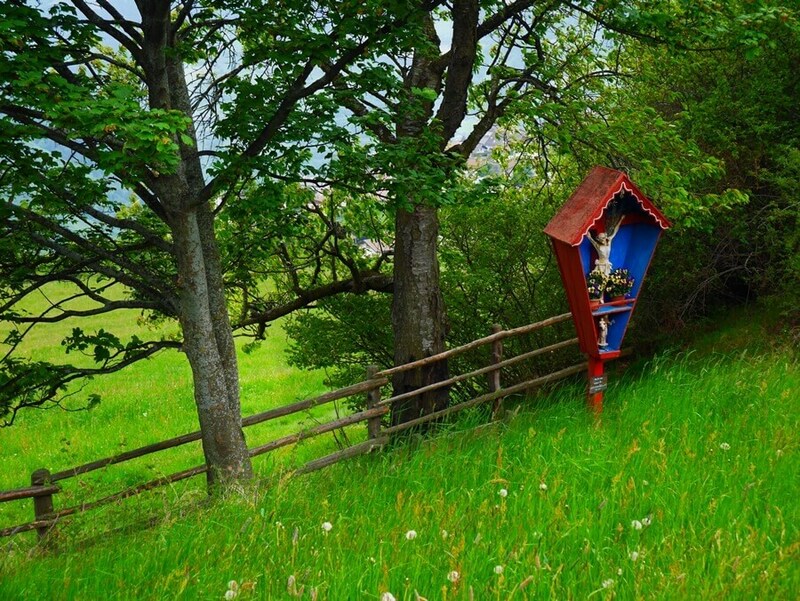 Many homeowners also adorn the exterior of their homes with a wayside shrine near an entrance. 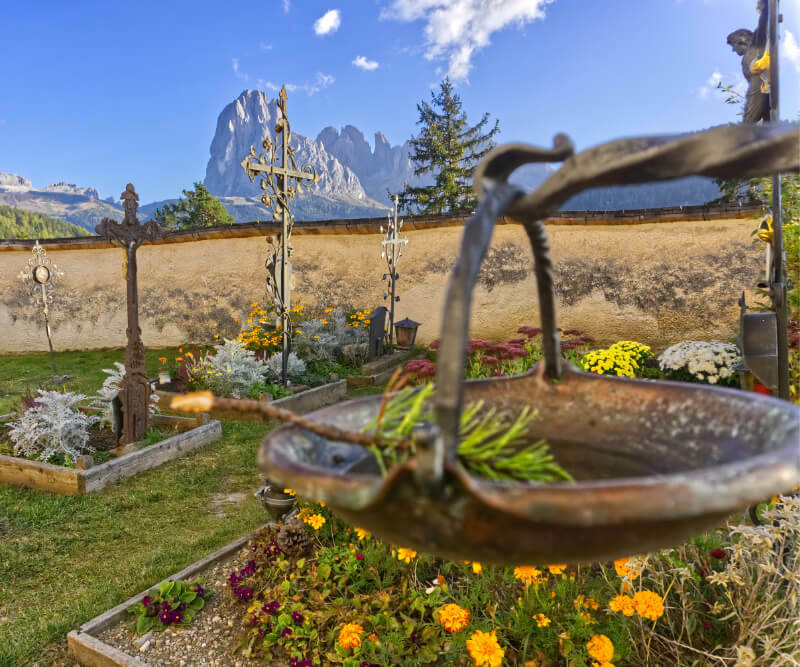 The wide array of wayside shrines in South Tyrol create fantastic moments to capture with your camera. 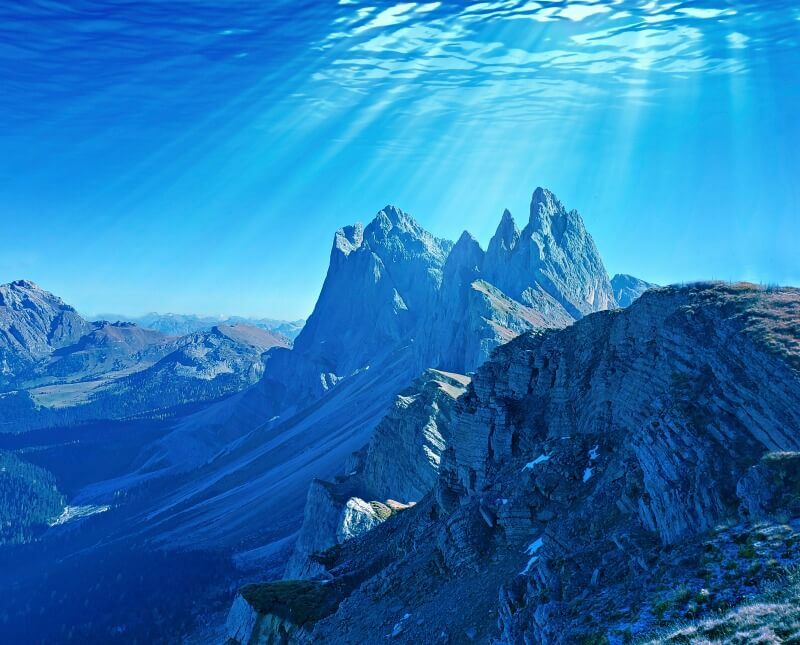 South Tyrol’s mountains express many moods giving photography enthusiasts the ultimate canvas to work on. We particularly enjoy coming across shrines early in the morning when clouds are beginning to lift off the timbered slopes. 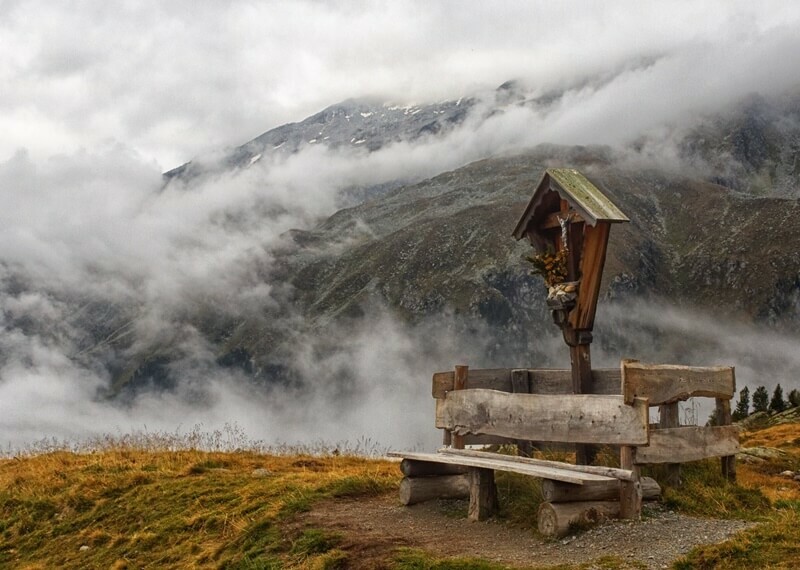 Rosaries, photographs and candles adorn many of the wayside shrines you’ll encounter on your hikes. 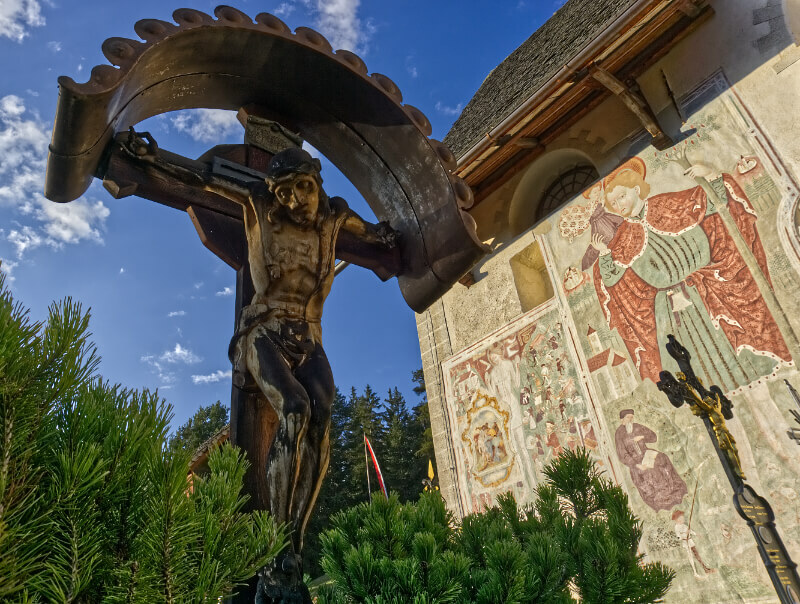 You don’t have to be religious or spiritual to find South Tyrol’s wayside shrines enchanting. 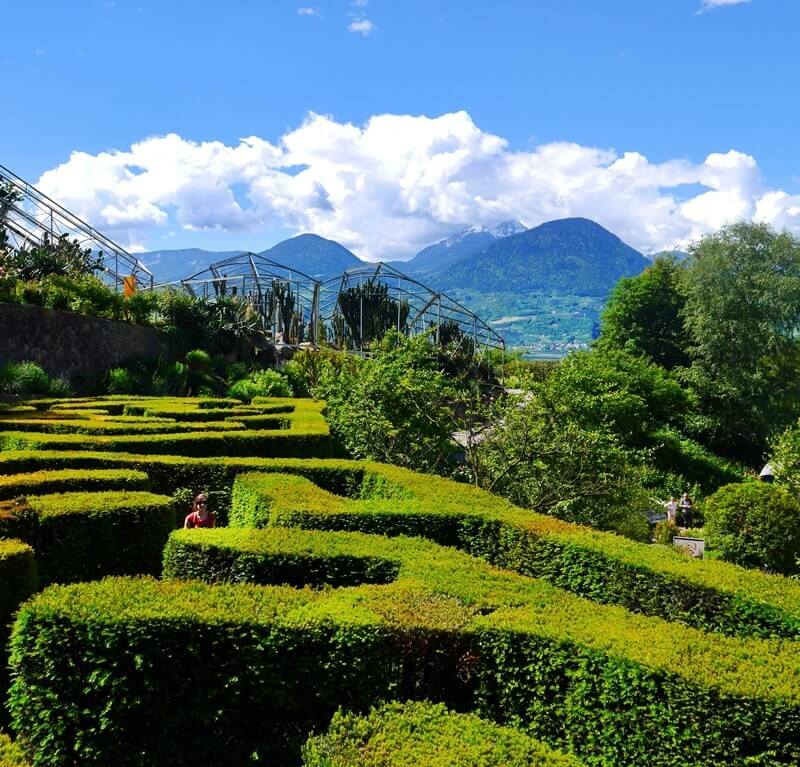 When you unexpectedly encounter one set among vines in a steep vineyard or deep within an Alpine forest, taking a moment to admire its beauty and the soulful devotion of the locals who safeguard the shrine is a reward unto itself. 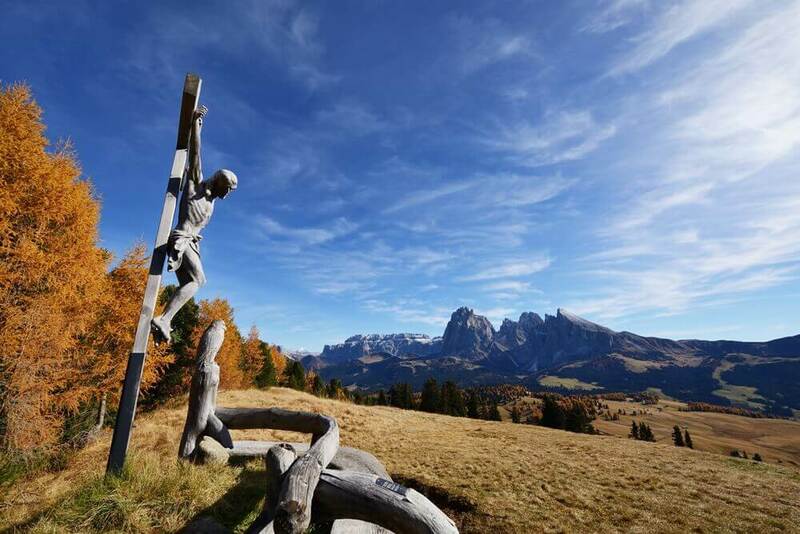 For those that want to bring the peaceful sight of a wayside shrine into their home, many woodcarving shops located throughout the villages of Ortisei, Selva di Val Gardena and S. Christina in Val Gardena offer wayside shrines for sale. A DEUR Sculptures’ master woodcarver chiseling a shrine piece from chestnut. These charming shops will give you plenty of garden shrine ideas as well as ones ready to be hung on a wall within your home. Thankfully, fitting one in your suitcase is not an issue. Most shops will package and ship them abroad. The charming DEUR Sculptures shop in St. Christina. Beyond shrines, the shops also sell countless other carvings from quaint figurines to life-size statues that grace some of the world’s most celebrated cathedrals. The artwork on display rivals that of a museum. Well worth a visit even if you do not intend to bring home a wayside shrine. 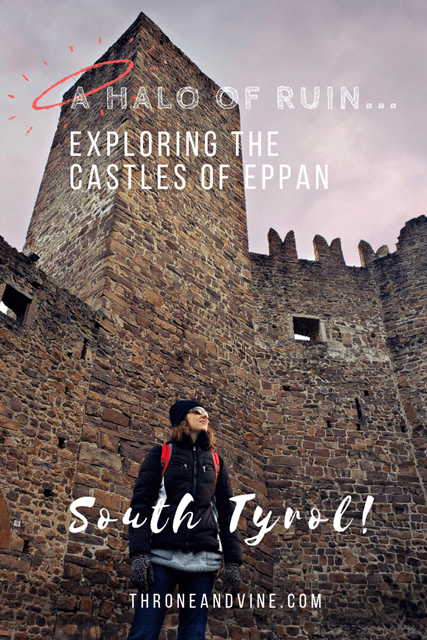 If you came across this article without knowing much about South Tyrol, take the time to discover what we consider Italy’s best-kept secret. 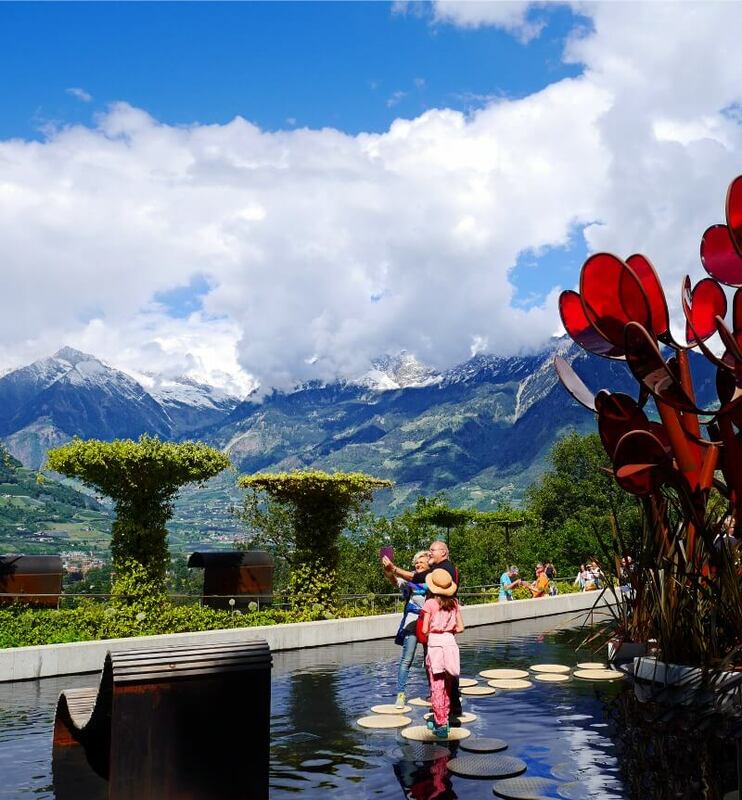 Whether encountering a wayside shrine along a mountain trail or savoring authentic Alpine wine and cuisine from a local farm, the traditions of South Tyrol inspire a deep affection for the land and its people. 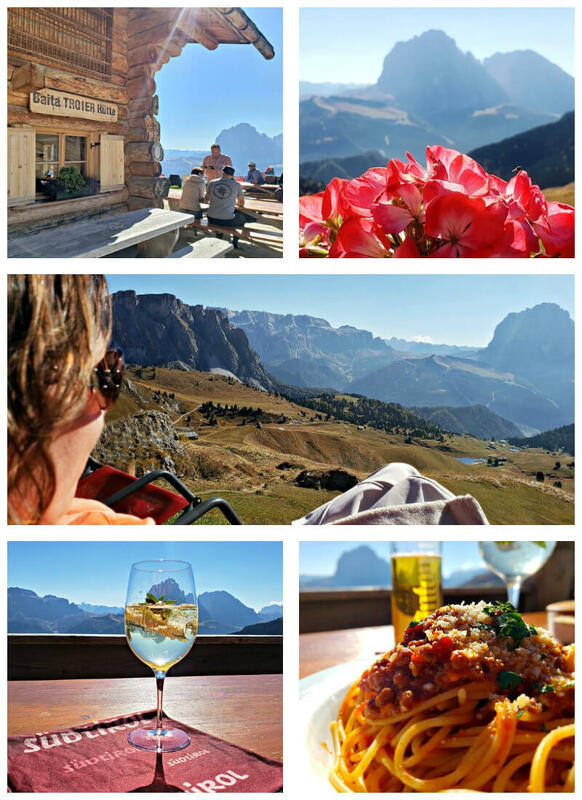 A trip to this hidden gem in northern Italy stays with you for life.